What is Compression and How Do I Use it? If you're just jumping into home recording, you may find yourself doubled over by the massive amount of plugins out there. You may have even gotten a bundle of them with your recording software for free, but might not know what the heck each of them does. Maybe you're moving knobs but not really hearing a discernable difference. It can be hard to know where to start, so in this article, we’ll talk about one of the most common mixing tools: compressors, review some essential concepts and look at two classic compressors that are included in many plugin bundles. This article does assume that you have a version of the LA-2A and 1176, but you can still learn a lot without it. And you can download a free trial of the Waves version as well, at www.waves.com without too much trouble. A compressor lowers the loudest levels of an incoming signal, thereby lowering the difference between the quietest and loudest signals. Let’s take a sung vocal for example. Imagine a song where a singer sings very quiet in some sections, then belts in others. Especially in a track with other instruments playing, very often those quiet signals get lost in the mix. Unfortunately, you can’t just turn the overall level up because then the loud parts are way too loud, and riding the fader is impractical. So we use a compressor to automatically lower those loudest signals. If set properly, we won’t have as many extreme volume changes, and our vocal will tend to sit more nicely in the mix. This can be applied to other instruments as well, although some don’t need it as much as others, as we’ll see. There are two extremely common compressors that we’re going to look at as we jump inside the basics of compression: the LA-2A and the 1176. Get familiar with these names as they are the bread and butter of compressors. Let’s start with the LA-2A. This is a great compressor because it’s ridiculously simple and ridiculously effective. There are only two main knobs on it: peak reduction and gain. Peak reduction is exactly what we talked about before. It reduces the peaks, or highest levels, of your signal. You’ll notice right away that the volume gets quieter as you apply this. This is where the gain knob comes in. This will allow you to bring back up the compressed signal to any level you desire. This is also referred to as makeup gain. For simplicity’s sake, you can match this to roughly the volume that you had before compression, but be sure to watch your meters. You’ll want to make sure you bring it to a good, solid level that isn’t clipping. You will also notice that as you apply more peak reduction, it tends to have a “squashed” sound. Welcome to the world of compressors! This has been used for great effect, but has also been the detriment of entire tracks. Get familiar with this sound so that you can apply it judiciously. The LA-2A also has a switch to change it from compressing to limiting. We’ll talk a little more about this concept below. One way boosts the signal up into the threshold. Picture yourself in a room with an opening ceiling directly overhead. You represent the signal, with your head being the loudest sounds. The opening represents the threshold of the compressor. Imagine that the floor moves up and you begin to go through the opening. That’s the way some compressors move the signal into the threshold — they turn it up until it goes through the threshold. The other way compressors deal with the threshold is by moving it down into the signal. Picture yourself in a room with an opening directly overhead. Now the ceiling moves down until you’re through the opening. This is the other way the threshold control works — the signal level stays the same but the threshold moves down into the peaks. The peak reduction knob on the LA-2A works the way that the second scenario describes. The 1176, on the other hand, works the way the first scenario describes. As you turn the knob to the right, you are raising the input signal and effectively changing the threshold. 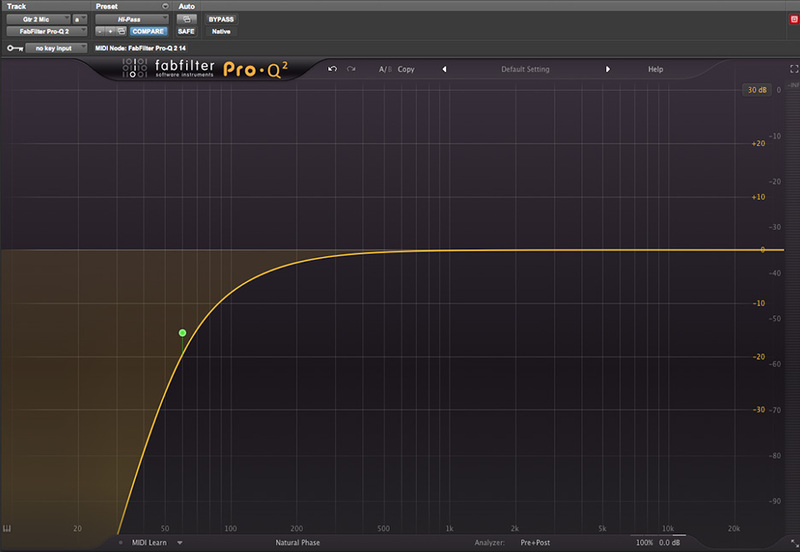 The output knob then balances this out and you can bring the overall level back to an optimum level for your track. Again, I usually try to keep this roughly the same level as my uncompressed signal, watching my meters closely for good gain structure. Next let’s talk about the attack function. The attack sets the time it takes for the compressor to respond to the signal once it has passed the threshold. This is handy on some signals, because you can soften the blow a bit. Let’s say you like the general compression that is occurring, but you just need it to be a little less immediate. You can ease into it a bit by slowing the attack time. A good example of this is on an acoustic guitar. A medium to up-tempo strum pattern will usually have a quite a few transients, or peaks. A typical acoustic guitar waveform. Let’s say you’ve set a moderate to large amount of compression to give the acoustic a sense of energy and excitement. If you ease off the attack a little bit, you’ll allow some of the transients through, which will keep the generally compressed sound, but still allow some of the pick attacks to not get too squished, thereby potentially sounding a little more natural. Opposite of the attack is the release knob. This determines how quickly the compressor “lets go” of the signal. This is handy for something like a kick drum. For instance, let’s say it’s being played at a slow tempo on 1 & 3, like the beginning of “Livin’ on the Edge” by Aerosmith. If the release is set too short, then the compressor will let go too soon and drop the natural sustain of the kick. Conversely, if set too long, and you’re really compressing the heck out of it, the kick will lose it’s natural decay and blend in with the next kick hit. On the 1176, as you turn the attack and release knobs to the right, clockwise, you get faster settings. Once the signal is compressed, the ratio determines how much level comes out. So for example, a common ratio is 4 to 1 (written 4:1). This means that for every 4 dB of level reduced, 1 dB comes out. Pushing in the 4:1 Ratio button on the 1176 employs this setting. Other ratio settings on the 1176 are 8:1, 12:1, and 20:1. The higher the number, the more compression you get. Once you get to 10:1, you are doing what they call “limiting.” This means that effectively almost no signal can get past the threshold, other than maybe some peaks and spikes. This can be controlled in some devices, and we will discuss this in more detail in Pt. 2 of this series. The 1176 also has an “all buttons in” feature. You can quite literally press all four ratio buttons in and end up with some seriously extreme settings. Use with caution but get ready to grin. This is a favorite of many engineers, and most plug-in emulations have this feature. You can get in the habit of watching the needle move from or return to 0 as your compressor works. To some degree, you can visually set your values to this. On something that is played in intervals like a snare drum, you can see and make settings based on how fast it reacts (attack), how slow it returns (release), and how much it’s compressing (input). On something that is continuously playing like a strummed acoustic, this may be bit more challenging, although you can see whether it’s only touching the loudest signals, or a good deal of the signal. If the needle is going all the way down to -10 or -20 you’ve probably got some serious compression happening. As you can see, the 1176 has a few more features than the LA-2A, allowing you to be a little more specific in how a signal is compressed, but both do what they do fantastically. One of the first things you’ll want to do before compression is to consider putting a high-pass (or low cut) filter on. This is simply an EQ that is set to cut the excess low end out. You can sweep the frequencies and find a sweet spot for it, but usually somewhere between 80 and 120 Hz will work for a starting point. Use your ear. If you’re EQing a low-end instrument like a bass or kick drum, you may want to set it lower, if it’s an high-end instrument like a cymbal, you can set it higher. Prominent low-end frequencies can trigger a compressor, sooner than you want it to, so by filtering these out it’ll help make sure you’re compressing the important stuff. Using a High-Pass filter is a general rule of thumb on basically all instruments. The goal is to avoid low-end build-up both on an individual track as well as across the entire mix. This can actually go a long way to an instrument sitting in the mix or not. We’ve looked at some vocal, drum, and acoustic guitar examples. Let’s look at some other instruments. Overdriven electric guitars tend not to need as much compression, as they are already fairly compressed. Look at the waveform of a rhythm guitar on a rock track. A typical rhythm guitar waveform. You’ll notice that there’s largely a solid block with little spikes popping up. This means there’s very little difference between the loudest and quietest signals. As the guitar gets cleaner and less overdriven, you will notice more dynamic range and may want to increasingly compress it. Let your ear be the judge. Pianos tend to be fairly dynamic, so some moderate compression here can do well. Be careful on an intimate track though. The compressor will effectively raise the quietest signals and if you’ve got ambient noise in your track, these will get magnified. Older analog recording machines have what is called a high noise floor, meaning that there is an inherent amount of noise created by the recording machine itself. You had to make sure you had a very strong input signal to compete with the noise floor. Digital machines are dramatically better in this respect, although for home recordists, ambient noises like computer hum can very quickly get magnified by compression. Wind instruments are similar to a piano in that they can be fairly dynamic but you have to be careful. Not only for the noise floor issue, but because these instruments tend to be used in classical music, and classical music is very frequently intentionally dynamic. You can actually affect the sound of the performance by over-compressing. Err on the side of caution. 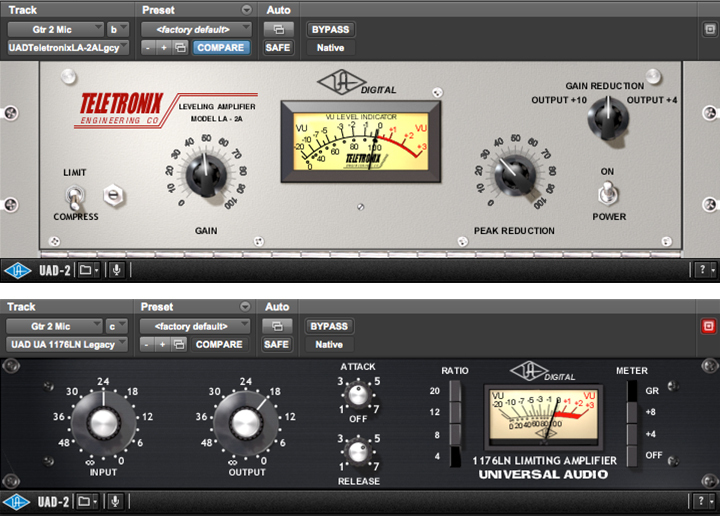 Which Compressor Plugin Should You Get? So whose version should you got? In my opinion, Universal Audio has the closest digital replica of its hardware counterpart. But you have to have a UA Interface, and for musicians who travel a lot, especially on airplanes, this may not be viable. Waves' version is an industry standard and can work off a thumb drive, but be prepared to effectively buy it again once your Waves Upgrade Plan runs out. Bomb Factory's 1176 has been used on countless pop records, and although it’s the “cheap-o” version, it has a sound that can be desirable. T-Racks and Native Instruments also have excellent versions worth looking at. Today on our most recent installment or “Recording Tricks,” Sean teaches us how to reamp an electric guitar! 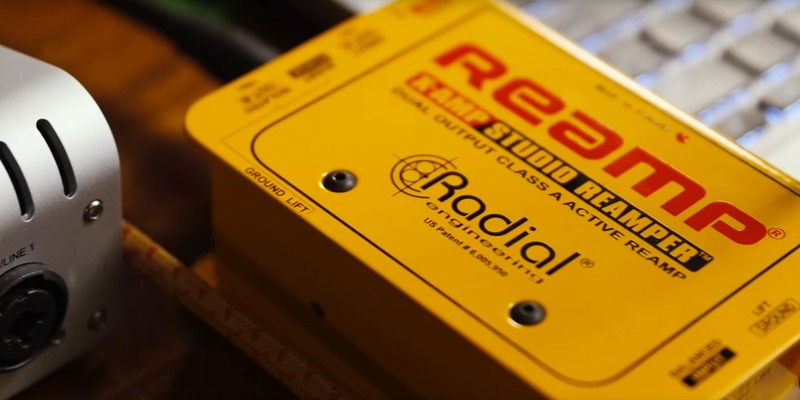 Using a Universal Audio Apollo Twin, a Radial X-Amp Reamp, and a few key effects, we see just how (and why) you’d want to reamp a guitar track. I will also steer you to try out the hardware versions. Plug-ins these days are great, but in my opinion, there’s just nothing like the real deal. There is something magical when you hear a great vocal being sung through one of those babies. It takes a little time to get inside the controls of a compressor and really hear the differences that each knob makes. But with some experimentation, and some experience compressing various instruments, you start to realize that some of the more-subtle features can really come in handy.